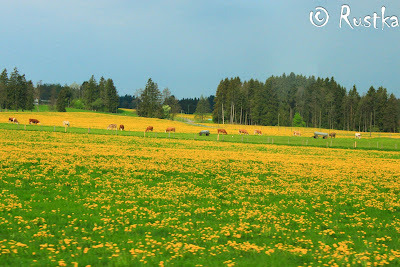 The view along the journey to Füssen was so beautiful and worth to see, many wide grassland with blooming wild flowers, farms and also a great view to the German side of the famous alpen mountain. 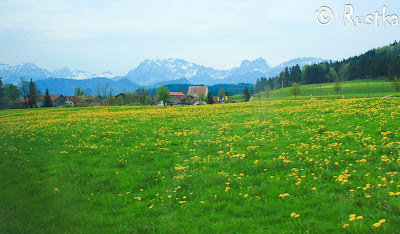 These are the pictures, I took while in the train to Füssen. 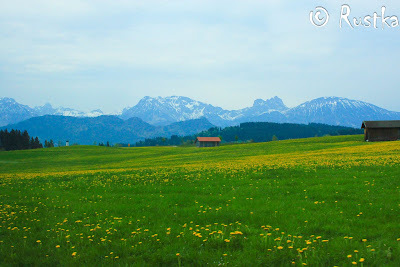 We went by there in early spring this year to visit the famous Neuschwanstein castle. To get to this castle from München/Munich by using public transportation, first we took a train to Füssen (about 2 hours) and continued using a bus to Schwangau. We chose to buy the Bayern/Bavaria ticket which costs only 29 euro for max. 5 people and valid in all public transportation (economy class) all day long in Bayern (province) .